A year ago this fall, I stumbled around in the dusky light, making my way through trees neatly labeled. Paths crisscrossed, and I circled the campus trying to find the obscurely marked building where next day I would be interviewing for this job as magazine editor. I paused at the crest of Parrish Lawn and looked down Magill Walk, flanked by flame-orange trees. I’d visited many college campuses but never encountered one so breathtaking, so neatly wedded to its natural setting. Could I picture myself here? It seemed almost too magnificent for me, a flatland-Ohio girl. But the leafy beauty drew me in, and my desire to portray this community in this place overcame my awe. While the Scott Arboretum and Crum Woods, which filter flowers and lush plant life throughout the College campus, make the prospect of working at Swarthmore appealing, this “brotherhood of venerable trees” (thanks, Wordsworth) also heightens the College’s appeal for its future scholars. 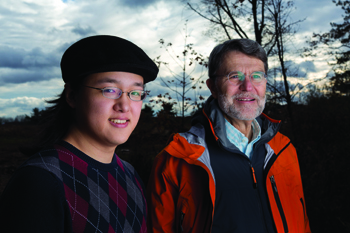 Ahn is a biology major and environmental studies minor who spent the summer and the fall semester working in the lab of Jorge Sarmiento ’67, professor of geosciences at Princeton University. Ahn is doing predictive and conceptual computer modeling for climate change. His work, affiliated with Princeton's Atmospheric and Oceanics Program, grew out of an extern experience last winter. He was primed for serious work on climate change after helping to found a weekly radio show on the topic, which evolved into the student organization Think Climate. Like many students, faculty, staff, and alumni Ahn is dedicated to treating the natural world with reverence and is committed to embracing sustainable practices and resource management not only to benefit this particular campus but the world beyond the Crum Creek that borders the campus. It is a value system one might expect to find at a college founded by a religious order that was concerned with furthering the greater good and was committed to the earth. Carr Everbach, professor of engineering and one of the College’s hardest-working and most vocal environmental advocates for the last 20 years, echoes Charlton’s reference to social responsibility. “Swarthmore is unusual in that it has a social mission built into itself. That should make it more facile in bringing practical benefits from theoretical constructs. There is a 150-year tradition of Swarthmore students actually going out and trying to make the world a better place,” he says. The Lang Center provides strong support for students dedicated to environmental sustainability by creating and funding experiences that expose them to the issues and encourage them to participate in proposing and enacting solutions, maintains Charlton. These include summer internships on sustainability as well as sustainability projects enacted by Lang Opportunity Scholars, such as zero-waste elementary schools. Lang Center Interns on Sustainability support the College’s Sustainability Committee (SusCom) and keep in touch with the community’s growing demand for responsible action on environmental issues. SusCom’s purpose is to make recommendations to the president and College community on policies that promote environmental sustainability and the most efficient and responsible use of College resources. It coordinates and supports campus sustainability efforts and initiatives. Charlton also mentions the Lang Center–funded Green Advisers—students who promote sustainable practices in residence halls. In addition, the center boosted campus sustainability by hosting a full-time, 10-month sustainability coordinator, whose term ended last spring, and brought to campus for this academic year the first sustainability-focused Lang Visiting Professor for Issues of Social Change (for more on Giovanna Di Chiro, click here). While the Lang Center is a major conduit for student environmental interest in and out of the classroom, the College’s interdisciplinary environmental studies (ES) minor encourages students to explore the nitty-gritty of sustainability through a multitude of lenses. “Given the mission of this college, it is very appropriate for the College to think about sustainability from many angles,” says Peter Collings, Morris L. Clothier Professor of Physics and coordinator of the ES program. Currently there are 17 ES minors and four special ES majors in the junior and senior classes. In addition, 53 percent of students take at least one course in the program. Developed as a concentration two decades ago, the ES program received a major boost recently when the Andrew W. Mellon Foundation awarded Swarthmore $591,000 to support the creation of an integrated Tri-College (Tri-Co) program with Haverford and Bryn Mawr. Now in its second year, the Tri-Co ES program enables students to take part in case-study–based introductory courses, capstone seminars, and a large number of ES elective courses at any of the three campuses. This spring, Richter Professor of Political Science Carol Nackenoff, who coordinated Swarthmore’s ES program before Collings, is teaching the ES introductory course with Everbach on water politics and policy, centering on China. She hopes to incorporate onsite learning in China and language study. A second Mellon grant, a $1 million challenge to be matched 2-to-1 by the College, has endowed a new tenure-track position in environmental economics that will be integral to the ES program but housed in the economics department. The new professor will have teaching responsibilities in ES and economics. Ellen Magenheim, professor and chair of economics, observes that this generation of Swarthmore students is particularly attuned to environmental issues. “I’ve felt there was a gap in the curriculum, and there is a growing interest in the environment and environmental studies.” The new position, for which she, members of her department, and ES program faculty are now reviewing candidates, will close that gap. Despite the growth of Swarthmore’s ES program in recent years, more could be done to strengthen it, according to Collings. “If the College wants a program it can be proud of, it needs to offer a major.” He notes that a few ES students, led by Ben Goloff ’15 and Julia Carleton ’15, wrote a creative and carefully considered proposal for just such an expansion this fall. As a result, the ES committee will discuss the possibility of making a formal request to the College’s Council on Educational Policy for an ES tenure-track faculty position. 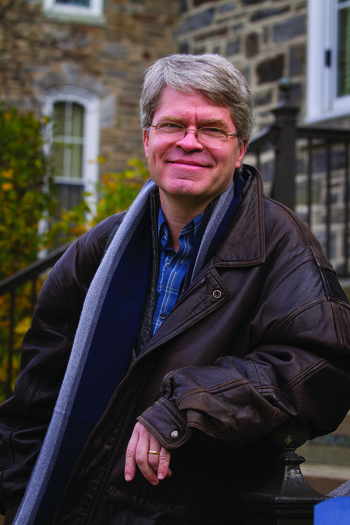 A frequent contributor to the ES program since its inception, Mark Wallace, professor of religion, is teaching the senior capstone course at Swarthmore this spring. The Extraction Industry and the Liberal Arts will “look at the impact hydrofracking and other such practices have on colleges like Swarthmore,” Wallace says. Wallace likens the decision on whether or not to divest from holdings in fossil-fuel-related companies to the question of abolishing slavery, which the Quakers grappled with in the 1860s, when the College was founded. Divestment is an issue the Board has seriously addressed but is not considering at this time, according to Board member David Gelber ’63, a veteran news producer who is developing a TV series on climate change. To address climate issues through proactive shareholder efforts, the College has joined Ceres, a network of investors, companies, and public interest groups seeking to promote sustainable business practices. The College plans to co-file shareholder resolutions related to climate change. But Thayer doesn’t just talk the talk. Visit his house in winter, and you’ll find out. But wear your fleecy. He keeps his thermostat at 60 degrees. “Put on some socks and sweats, and you’ll survive,” he says with a grin. This reserved, diesel-car–driving man also is a stickler for turning the lights out when he leaves a room. Besides helping to lead the College’s all-campus voluntary energy-reduction efforts that have yielded cost savings on utilities, Thayer co-chairs both SusCom and the Climate Action Planning Committee, the latter of which is expected this month to issue guidelines for advancement toward carbon neutrality. Signatories to the ACUPCC agree to do a campus emissions inventory; set a target date and interim milestones for becoming climate neutral; take immediate steps to reduce greenhouse-gas emissions; integrate sustainability into the curriculum; and make the action plan, inventory, and progress reports publicly available. From her perspective, the innovative use of horticulture and plants not only creates beauty but addresses a lot of ecological conundrums. As one example, she invokes the College’s green-roofs protocol, led by Jeff Jabco, director of grounds and coordinator of horticulture for the Scott Arboretum. Green roofs are rooftops that sport waterproof synthetic membranes topped by live plants. While attracting birds and insects, green roofs also reduce air-conditioning costs and have a longer lifespan than conventional roofs. They also help with storm-water management, enabling the capture and use of 50 to 90 percent of the rainfall. The College arboretum has several green roofs—on Alice Paul and David Kemp residence halls, the Scott Arboretum Wister Center, a storage building at Papazian Hall, and a new one planned for the Lang Performing Arts Center next summer. “LPAC is the largest flat-roof building on campus, and this will have a big impact [in reducing the amount of water that runs down the roof and into the Crum Woods],” Jabco says. 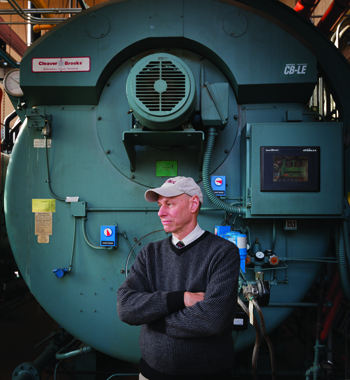 As Thayer quietly goes about powering up the College’s sustainability efforts and powering down energy use, he is always mindful that the students are the wind at his back, the voice in his ear. Students have helped the College’s cause by providing money from the student-founded Renewing Fund for Resource Conservation to install energy-saving lights in many places on campus. This has resulted in considerable cost savings. Thayer returned those savings to the fund and has been approved for another loan to continue the project. Camille Robertson ’13, a biology and educational studies special major who served on SusCom for several semesters, worked on the Climate Action Plan in fall 2011 and was a student gardener, contends, as do most campus sustainability leaders, that a full-time sustainability director should be hired. Mindful of this pressing need, the Board will consider the proposal for a position this winter. 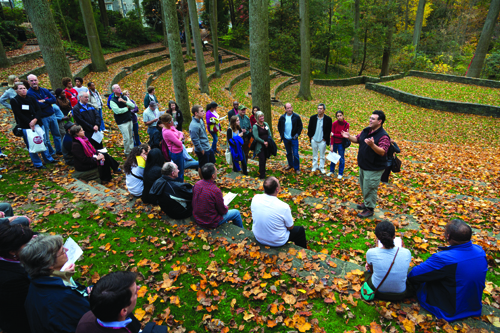 For more about sustainability efforts at Swarthmore, go to bit.ly/SwarthmoreSustainability. To watch how to build a green roof here.